Baseboard heat installation is an efficient option for home heating. Baseboard heating systems, similar to radiant heat, warm up room-temperatures more gradually than forced-air heating systems. They work on the same principle and offer similar advantages. Baseboard heat installation works by transferring warmth from one object to another and are commonly found at the base of a wall(s) in each room. 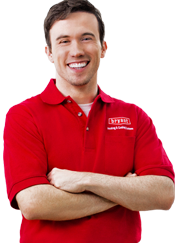 Air Tech is your local expert for baseboard heat installation, replacement, maintenance and repair. When you’re ready to upgrade your existing heating system with a higher-efficiency baseboard heating system, trust in Air Tech to get the job done right the first time. Why Choose Baseboard Heat Installation? Zone- Homeowners have better control over what rooms get more (or less) heat with baseboard heat. Think about your basement or remodeled garage, for example. These two areas are notoriously drafty which makes a baseboard heater an efficient option. This allows you to not only control comfort levels throughout the home, but also save big on heating costs. Air Quality- For family members prone to allergies or respiratory ailments, baseboard systems are often the preferred method of heating the home. Unlike forced-air systems that can circulate airborne irritants, such as dust and allergens, baseboard heat comes out evenly and does not blow air around. Supplemental Heating- Baseboard heat installations are optimal for those who live in older homes that rely on an older central heating system. Supplementing with a baseboard heater can provide a quick and affordable solution to help homeowners reach their desired temperature. As an effective and affordable solution for many homeowners, baseboard heating systems can be either used for the whole house or as a supplement in spaces that require extra heat. 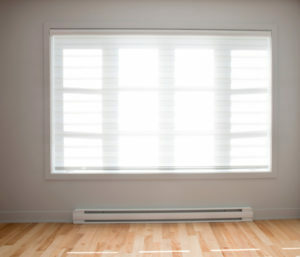 As a highly-efficient option, baseboard heaters sit directly on the floor (or a few inches above). While they use a thermostat to control the overall temperature, they offer a more budget-friendly option to heat certain spaces, rather than pumping out heated air throughout the entire home. Plus, since they do not require ductwork, installation is quick and maintenance is rarely necessary. Two main types of baseboard heaters are hydronic or electric, also known as convection. While they have many similarities: both offering a gradual, efficient option to heat a room, both built with the same kind of metal framework and both looking very similar (at least on the outside), they have their differences. Electric baseboard heaters work indirectly through convection to circulate warmth. Typically found beneath windows where cool air tends to draft, an electric baseboard unit warms the air by a series of metal fins. The end result? A circular flow of warm air, referred to as a convection current. Hydronic heaters work by using an electrical current to heat water which radiates heat into the space. As fluid takes longer to cool off than the metal fins of an electric baseboard heater, hydronic heaters operate more efficiently. Why Choose Air Technical Services for Baseboard Heat Installation? At Air Technical Service Heating, Cooling and Plumbing, we install, replace, repair and maintain heating and cooling systems throughout LBI and the surrounding areas. Since 1999, residents and businesses have trusted our technicians to get the job done right the first time. If you’re interested in installing a new baseboard heating system or already have one that requires service, call Air Tech today!